On Nov 22, the two Koreas connected a cross-border road on Arrowhead Hill. Korean War soldier remains are being recovered in this area. The US Defense Secretary James Mattis announced that it will reduce the scale of the Foal Eagle exercise scheduled for next spring. On Nov 30, the two Koreas began the initial inspection for the inter-Korean railway. The groundbreaking ceremony for the inter-Korean railroad and highway is scheduled for the end of next month. This development follows the UN’s decision to exempt inter-Korean railway inspections from sanctions. It is also the result of the US support for the inspection project per the ROK-US working group meeting. Observers point out that the inter-Korean cooperation hinges on US approval, while others argue out that the fact that the Korean government requires sanction exemptions from the UN is proof that the inter-Korean railway project violates sanctions. Meanwhile, the UN Security Council is investigating potential sanctions violations including the use of President Moon’s vehicle in Pyongyang and the delivery of North Korean pine mushrooms to South Korea. Amid all the progress on inter-Korean cooperation, the Chief of South Korean National Intelligence Service Suh Hoon confirmed that there have been several attempts by North Korea to hack into South Korean and international cyberspace after the third inter-Korean summit. The governor of Gyeonggi Province Lee Jae-myung is embroiled in a political scandal after the police concluded that Lee’s wife made defamatory comments through twitter during the last presidential election. Lee denied these charges while the ruling TDP party was careful not to draw any conclusions. Though it is unclear how this case would unfold, some observers believe that it could lead to a split within the TDP. From Nov 27-29, President Moon visited the Czech Republic. Moon held a meeting with Czech’s Prime Minister Andrej Babiš and asked PM Babiš to support a South Korean firm’s bid to build a nuclear power plant in the central European country. Next President Moon headed to the G20 meeting in Argentina. On Nov 30, Moon held a bilateral meeting with the US President Trump which lasted 30 minutes. The two heads of state agreed that Kim’s visit to Seoul would provide an additional momentum for peace. Trump reaffirmed his determination to hold a second Trump-Kim summit towards the beginning of next year. The two leaders also agreed on the importance of maintaining existing sanctions until North Korea’s final and fully verified denuclearization. Moon urged the leaders of G20 to support the Korean Peninsula peace process. He also held several bilateral summit meetings with the Netherlands, South Africa, and Argentina. President Moon’s support is at 48.8%, which is the lowest since his inauguration. The decline in public support appears to be the result of economic downturn and a series of political scandals associated with the Blue House staff members and the ruling party. The lack of support for Moon was especially prominent among moderates, independent businessmen, homemakers, and people in their 50s. The South Korean Joint Chiefs of Staff announced that a Chinese military aircraft (possibly Y-9 reconnaissance) entered the South Korean Air Defense Identification Zone (KADIZ) on Nov 26. It first flew into KADIZ from northwest of Jeju Island at around 11:00 and entered the Japan Air Defense Identification Zone (JADIZ) at 11:38. It then returned to the KADIZ at 12:43 and finally exited the zone at 15:53. This is the seventh such incursion this year. The South Korean Air Force responded by scrambling 10 fighter jets, including KF-16 and F-15K. The Ministry of National Defense called in the Chinese military attaché to lodge a formal complaint. On Nov 29, the South Korean Supreme Court ruled that the Mitsubishi Heavy Industries should compensate the South Korean forced laborers during the earlier part of the 20th century. The Supreme Court’s decision is consistent with the ruling from Oct 30 on Nippon Steel & Sumitomo Metal Corporation. South Korea’s Ministry of Foreign Affairs stated that it respects the Supreme Court’s decision. The Japanese government and the Mitsubishi Heavy Industries responded that the court decision is regrettable and vowed to respond resolutely. According to a report released by the Korea Development Institute (KDI) on Nov 19, the 2007 Employment Act has contributed to a significant decline in the country’s overall employment. The Act requires employers to offer all contract employees with more than two years of employment tenured permanent positions within the company. KDI report states that since its enactment in 2007, regular employment has increased but total employment has declined. 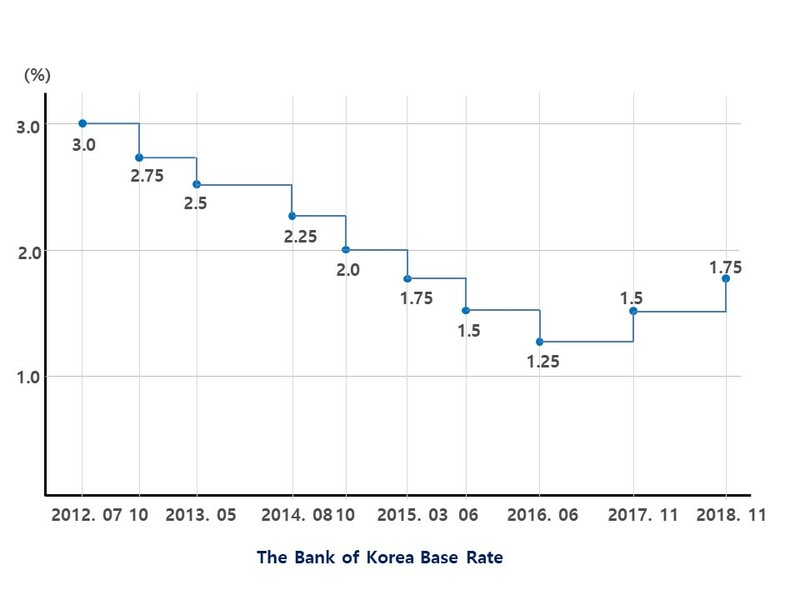 The Monetary Policy Board of the Bank of Korea decided on Nov. 30 to raise the Base Interest Rate from 1.50 percent to 1.75 percent, despite the growing uncertainty in the global financial markets. The Bank expects the decision would curb financial imbalances such as fast-growing household debt. Household debt in South Korea surpassed a record-high of 1,500 trillion won (USD 1.3 trillion) as of the end of September. On Nov 26, the government and the ruling Democratic Party agreed to lower the credit card commission fees for small businesses in an effort to revitalize the country’s slumping economy. For stores with an annual revenue between KRW 500 million and KRW 1 billion, the credit card commission rate will be cut from the current 2.5 percent to 1.4 percent. The rate on those with revenue between KRW 1 billion and KRW 3 billion will be lowered from 2.21 percent to 1.6 percent. For those with revenue of less KRW 500 million the rate remains unchanged (between 0.8 percent and 1.3 percent). “DMZ서 총 들고 만난 남북, 폭 12m 도로 연결”, 중앙일보, 2018년 11월 23일. “매티스 美국방 “독수리훈련 축소””, 조선일보, 2018년 11월 23일. The UN Command refused to permit South Korean trains from crossing the DMZ for four months. The inspection will be conducted for 18 days on the railway stretching over 2,600km. “남북 철도공동조사 30일 시작…한반도종단철도 꿈 첫발”, 한겨레, 2018년 11월 28일. “남북 철도-도로 연결 12월 말 착공식”, 동아일보, 2018년 11월 23일. “유엔, 남북철도 공동조사에 대북제재 첫 면제”,조선일보, 2018년 11월 26일. “유엔 “평양 남북 정상회담 등장 벤츠차·송이버섯 제재위반 조사 중””, 동아일보, 2018년 11월 29일. “서훈 “北, 평양 정상회담 이후에도 南 해킹 시도””, 동아일보, 2018년 11월 23일. “文대통령과 맞붙었던 이재명, ‘혜경궁 김씨’로 정치 최대 위기”, 조선일보, 2018년 11월 19일. ““이재명 억울해도 나가라” vs “죽으나 사나 민주당원””, 중앙일보, 2018년 11월 27일. “한미 정상 “김정은 서울 방문, 한반도 평화정착 모멘텀 제공””, 동아일보, 2018년 12월 1일. “한미정상 “비핵화 전까지 제재…김정은 답방, 모멘텀 제공””, 중앙일보, 2018년 12월 1일. “문재인 대통령 지지율 처음 50% 무너져”, 중앙일보, 2018년 11월 30일. “[사설] 급락한 문 대통령 지지율, 국정 기조 확 바꿔야 오른다”, 중앙일보, 2018년 11월 30일. “문제는 민생경제… 대선때 票줬던 중도-50대-자영업자 등돌려”, 동아일보, 2018년 11월 30일. Gallup Korea, Date: Nov 27-29; sample size: 1,001; margin of error: +3.1 at the 95% confidence level. “이제는 제 집 드나들듯 이뤄지는 중국 KADIZ 무단진입,” 중앙일보, 2018년 11월 26일. “日 정부·미쓰비시 “韓 배상 판결, 청구권협정 위반…수용 못해””, 조선일보, 2018년 11월 29일. “정부, 합의 파기 대신 ‘위안부 재단’ 해산,” 조선일보, 2018년 11월 22일. “아베 “한국, 국가간 약속 지켜야”…극우 의원들은 독도 영유권 주장 집회,” 조선일보, 2018년 11월 22일. “KDI “비정규직 규제 정책이 전체 고용 줄였다”,” 한국경제, 2018년 11월 19일. “한은, 1년 만에 기준금리 연 1.75%로 인상,” 조선비즈, 2018년 11월 30일. “당정 “카드수수료 2.05% à 1.40%…세액공제한도 1000만원까지” 개편방안 발표 (종합),” 한국경제, 2018년 11월 26일.